When it comes to something old, something new, something borrowed and something blue, Opal Sands Resort has happy couples covered — especially when it comes to the new and blue! The all-new resort on Clearwater Beach has just unveiled 17,000 square feet of indoor and outdoor gulf-front event space perfect for saying “I do” in style and sophistication. Whether seeking a venue for an energizing bridal shower, intimate rehearsal dinner, grand wedding ceremony or lavish reception that requires delectable catering, state-of-the-art audiovisual equipment and expert event planning services, lovers will find all they need to start their happily ever after off on the right foot. All of the resort’s indoor event rooms — from the 600-square-foot Aqua Boardroom to the 7,650-square-foot Opal Ballroom — feature floor-to-ceiling windows with Clearwater’s crystal blue skies, sandy white beaches and calming Gulf of Mexico waters as a backdrop. The spaces can host 16 to 811 wedding guests and boast modern AV equipment and high-speed Wi-Fi access to allow slideshow presentations or the streaming of music to go off without a hitch. Outdoor weddings under the radiant Florida sun now have a place to call home thanks to Opal Sands Resort’s 5,500-square-foot, well-manicured lawn. The space can accommodate a 40-foot by 60-foot tent for wedding attendees to mix and mingle pre- or post-celebration. 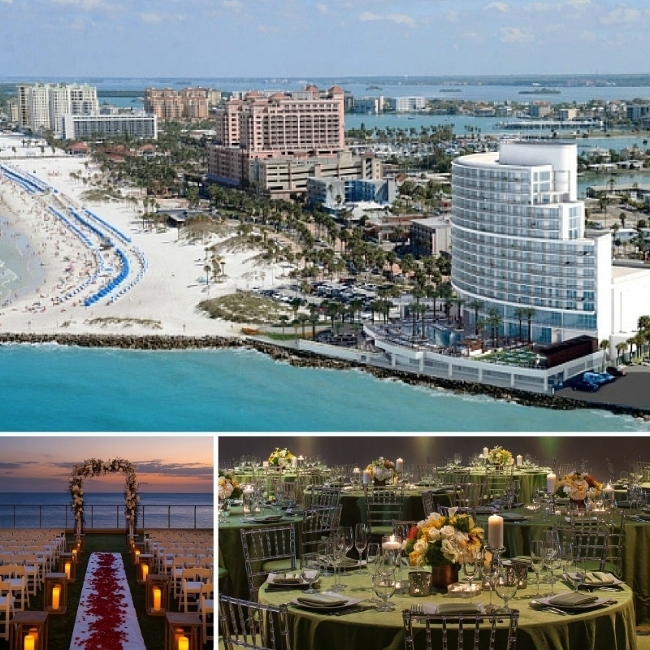 Experienced wedding specialists at the Clearwater Beach hotel are available to assist with every detail — from finding the right venue and choosing a pleasing menu to arranging reception entertainment and providing guests with activities during downtime. Organizers work in concert with the happy couple to ensure expectations and budgets are being met. Pre- or post-wedding pampering at Opal Spa affords the happy couple and their guests plenty of opportunities to get a massage, facial, manicure, pedicure or wax to achieve a new level of relaxation and rejuvenation. The spa offers signature programs with the most decadent therapies along with custom packages to create an ideal experience. The Clearwater Beach resort’s convenient location means wedding guests can turn their trip into a vacation of their own and explore Pier 60, the Clearwater Marine Aquarium, Busch Gardens, Lowry Park Zoo and Adventure Island. A professional concierge service also helps travelers discover the best of the area, book tours and rent jet skis, paddleboards and kayaks. When it comes time to retire after the big day, visitors will find 230 guest rooms and suites with modern amenities, thoughtful services and private balconies boasting panoramic views of the gulf. Post pictures from the event on social media channels thanks to high-speed Wi-Fi, and stay well-connected with flat-panel TVs with a host of available channels. The resort’s pillow-top mattresses sport luxurious linens, and plenty of fluffy pillows allow for a sound night’s sleep. For information about reserving Opal Sands Resort’s indoor or outdoor gulf-front event spaces, contact the sales team at 1-727-450-0380.